I recently met a very interesting gentleman who told me a story I thought was well worth sharing. Alastair farms eggs for Woolworths. These free range hens have a very short life, productivity wise. In order to ensure that their ending is a happy one, a decision was made to slaughter the chickens humanely and turn them into stock. I was so enamoured by this that I went into my local Woolworths and purchased some. The 500ml container consists 99% of chicken stock which is made up of chicken, water, onions, carrots, celery, leeks, herbs, garlic, parsley, black pepper, bay leaf, salt and yeast extract. I am not sure what the other 1% consists of. The emphasis is on using fresh ingredients and I am not certain cost wise how it compares to making the stock from scratch at home. But if you are keen on using store bought products that are sustainable, then this is for you. I had to amp the flavour a bit with the addition of salt, pepper and some dried herbs but I don’t mind that, as it allows me to change the flavour profile to suit the dish I am making. 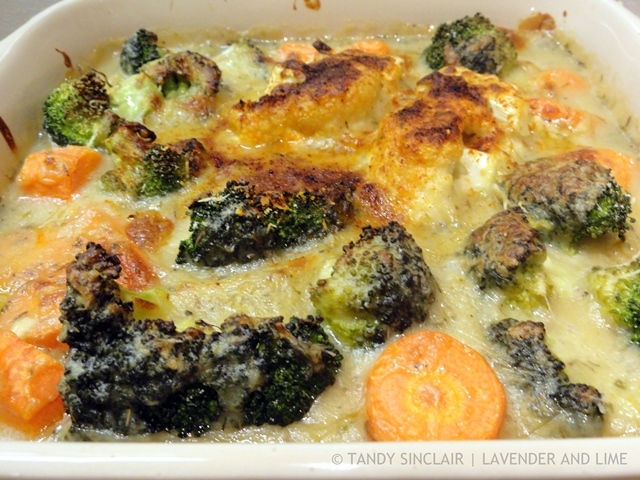 I chose to make gratinéed vegetables, using the stock as the base for the sauce and lots of cheese as cauliflower cheese is such comfort food. I always add other vegetables and have used broccoli, carrots and leeks to make this a one dish vegetable medley. Nothing can be better than cheese laden vegetables using what is in season. I love how you always provide us something of interest Tandy – the Alastair chickens! I agree with you that cheese is magic and roasted veg this time of year is ultimate comfort food. Now that is my kind of side dish! It looks wonderful Tandy. Looks delicious!! I’m with you, melty cheese makes everything amazing. Such a delicious autumnal meal! Do I see broccoli in this recipe? Oh I am so in love already. This is perfect for me to try this weekend, and I plan to do just that. This looks like a perfect healthy and delicious meal. Indeed cheese makes everything awesome. YUMMY! I have not made gratin vegetables since I can’t tell you when.. thanks for the reminder. I know my boys would love your recipe. I always have to look to see all the ingredients in products as here in HK they like to put MSG in everything they can and that makes me so sick, so I usually make most things from scratch like you. My Mom had MSG poisoning once and it was not pleasant! Yummy, a perfectly hearty meal! Really lovely looking gratinéed vegetables Tandy. It is better to have a good stock and add your own seasoning for sure. Tandy, I love leeks, but never had them like this – this grantineed dish sounds wonderful. And what an interesting story behind the stock! I think that if we are to use animals for food, the least we can do is slaughter them humanely. That looks like a good stock-like what you’d make at home. I’m so with you–cheese makes EVERYTHING taste better! :-) This dish sounds incredible! I love cheesy vegetables! It’s a great dish and it’s good to know that the chickens at the farm are used for something apart from just their eggs. Lovely tasty comforting dish Tandy. I have not done that for ages!